Cllr John F Bailey lives in Killiney with his wife Angela and their family. He has five daughters and two young grandsons. His family has lived in the area for generations, and he was born and reared in Dalkey. He is a member of Dun Laoghaire/Rathdown County Council. John is a former Managing Director of Brendan Tours Limited and former Managing Director of Budget Rent-A-Car. John is also a former publican in the constituency and was a registered Irish racehorse trainer. A GAA enthusiast, John served ten years as Chairman of the Dublin GAA County Board. During his tenure he initiated the building of Parnell Park and significant investment in promoting juvenile participation in sport. He is a long time member of the Cuala GAA Club in Dalkey. Cllr. Bailey topped the poll in the Dun Laoghaire Electoral Area in the 2004 Local Elections. On the same day, his daughter, Cllr Maria Bailey was elected to the County Council in the Ballybrack Ward and polled in excess of 2,000 1st preference votes. 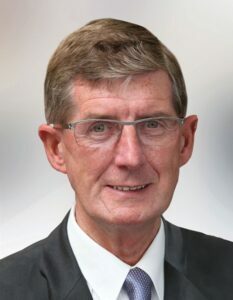 John has been a loyal supporter of Fine Gael throughout his life and his commitment to the party and innovative ideas were recognised when the Party Leader, Enda Kenny T.D. appointed him to the Fine Gael Dublin Task Force as Vice Chairperson. In this role, John contributed to the plan for the rejuvenation of Fine Gael throughout Dublin, a task and an honour which he thoroughly enjoyed. In his role as a County Councillor, John has worked closely with the public, community groups and residents associations to ensure the betterment of his constituency.